Even though your knife is made from the highest quality materials improper care can shorten the life of your knife. With just a little extra attention your knife is made to last a lifetime. The steel used in your knife is high carbon steel. The qualities of high carbon steel are such that your knife will hold an edge and cut like a dream. The surface of your knife will react to the acids and natural chemistry in the foods you cut with it. This will give it a unique and beautiful patina and over time it will become a part of your knifes personality. If your knife came with a custom antiqued or splatter patina then you are ahead of the game! Your knife will continue to develop patina the more you use it. High carbon steel can rust if not cared for properly. To prevent this from occurring, hand wash your knife immediately after using. Use warm soapy water and dry thoroughly. Avoid prolonged exposure to water as this may promote rust. After washing use a food safe mineral oil or a combination of mineral oil and beeswax on all parts of your knife. This is common in most high quality butcher block conditioners. Your handle is made from beautiful one of a kind burled or figured wood. It has been stabilized to increase durability. Wood however can still be sensitive to elements if not cared for. Follow the same instructions as caring for your blade and you should have no issues with your handle. The saya is a beautiful way to showcase your custom knife. It is not recommended for long term storage but for transportation and to protect the fine edge of the blade. You can condition the wood a couple of times a year with the same mineral oil and beeswax combination used on your knife. 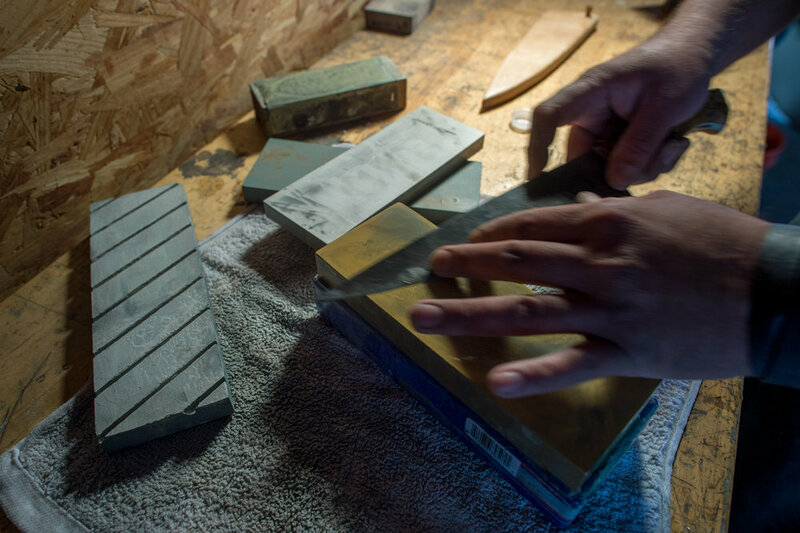 High quality whetstones are recommended to maintain the edge of your knife. If you don’t want to do this process yourself, your knife comes with complimentary lifetime sharpening. Just bring it in or ship it back to the workshop and It will be returned with perfectly honed edge.